it’s a very old practice. But is not done much anymore. It is a special, dedicated time to show Honor and Appreciation for those we love. Showing appreciation is magical, healing and has great spiritual significance. Anyone who has ever lost someone close knows that grieving and dealing with loss can be a long and tough process. And even more so because in our society, there is not much out there to help us. Feelings of loss and separation are a natural part of the grieving process. An Honoring Ceremony, when one is ready, can help us transcend those heavy feelings, focus on and reconnect to the aspects of that relationship that are a special and a permanent part of us. 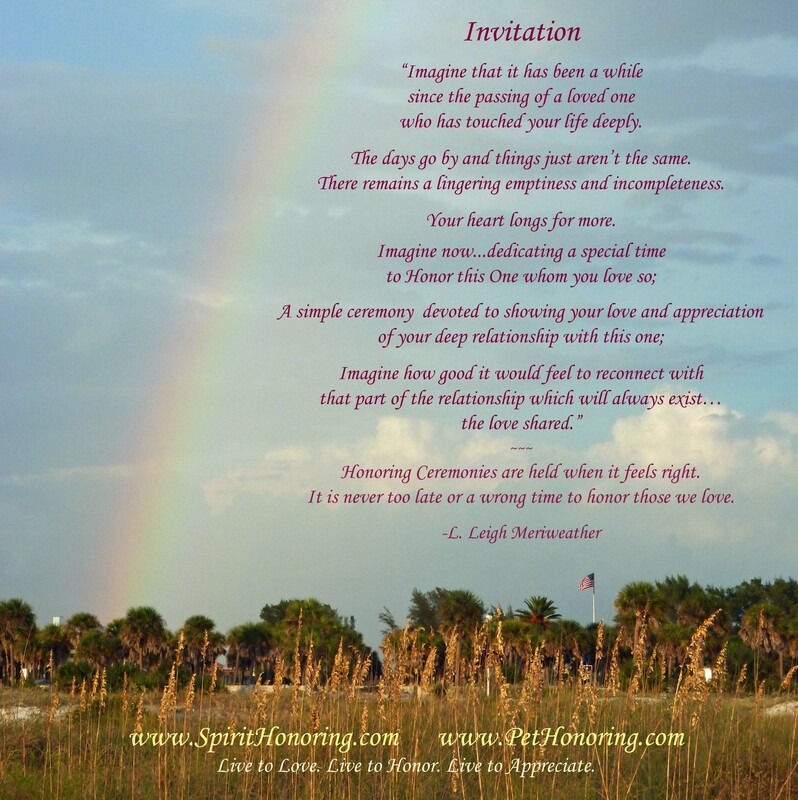 How are Honoring Ceremonies different from Funerals and Memorial Services? Good question. Funerals and Memorial Services are traditionally held close to the time of transition and serve as a way to mourn a loss. Memorial Services are without remains present and are less formal. Both are needed and an important part in grieving and expressing the heavy emotions that accompany death. However, grieving and dealing with the loss of a Loved One or Pet does not end there. Grieving takes time and the process is highly individual. The focus here, is on Honoring and giving thanks for the specialness of that One in our life, the love shared connecting us back to the aspects of that relationship that are a special and a permanent part of us. 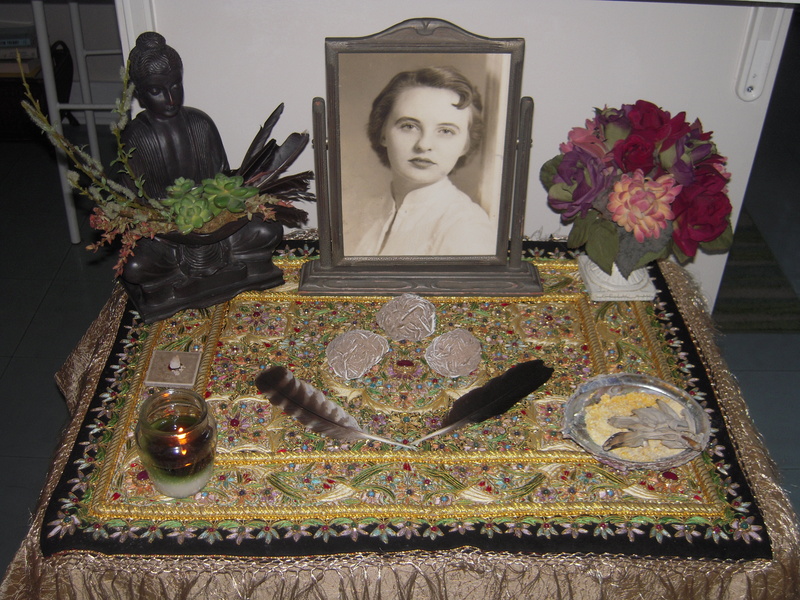 Honoring Ceremonies are usually done later, when it feels right and when one is ready. Some choose to do an Honoring Ceremony a few weeks, months or even years (or decades) after a transition. It provides a focused time just to say thanks and honor them. Appreciation and love are the best gifts we can give. Plus, it just plain feels good to say thank you for those that have had great value in our life. Honoring Ceremonies are held when it feels right. It is never too late or a wrong time to honor the ones we love. The basic, officiated, honoring ceremony starts at $100. There is a pre-consultation done and the ceremony is highly customized and officiated in-person or remotely. The ceremony typically will last up to an hour.